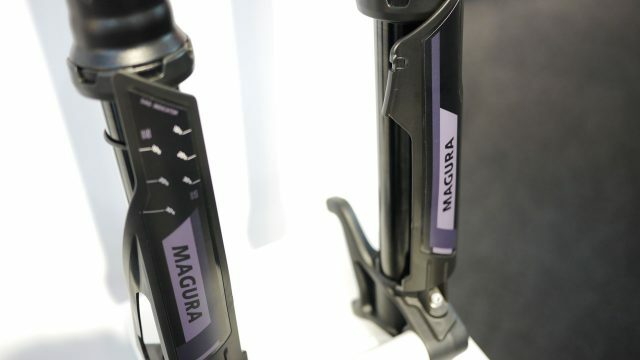 Magura had a few new things to show us at Eurobike this past week, foremost among them the new Boltron upside down fork. They couldn’t confirm anything regarding retail other than that it’s only going to be an OEM option for now. Here are the Magura Boltrons on a Haibike. 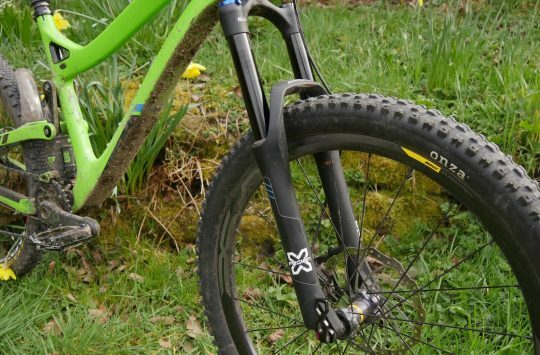 They’re designed for e-bikes, but will fit in anything that can take a tapered steerer. Here’s the business end. 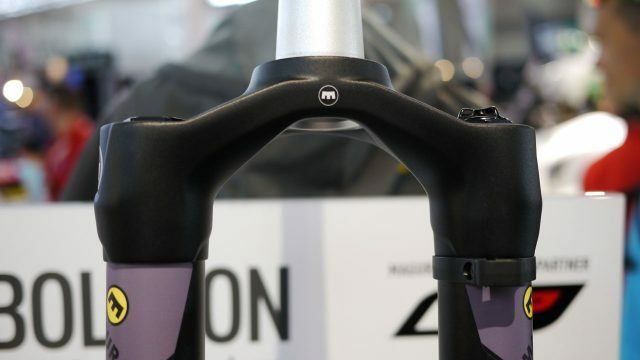 They’ll be available in 27.5″ and 29″ versions, apparently with 120mm and 150mm travel options for both wheel sizes. 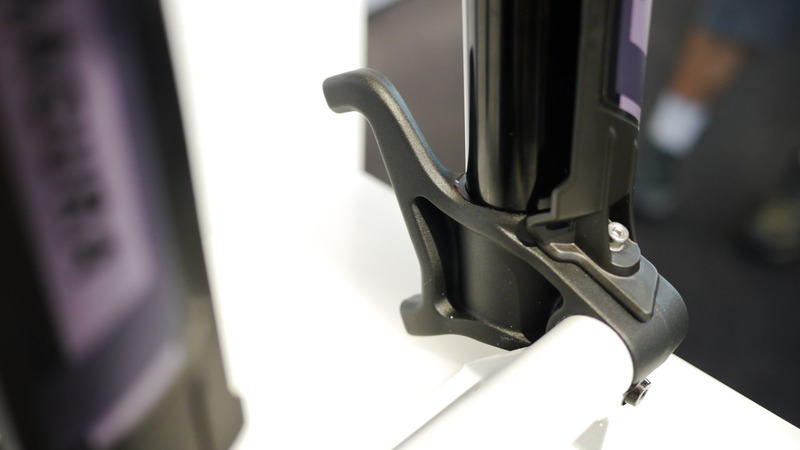 The stanchion guards bolt into place at the front and sides. 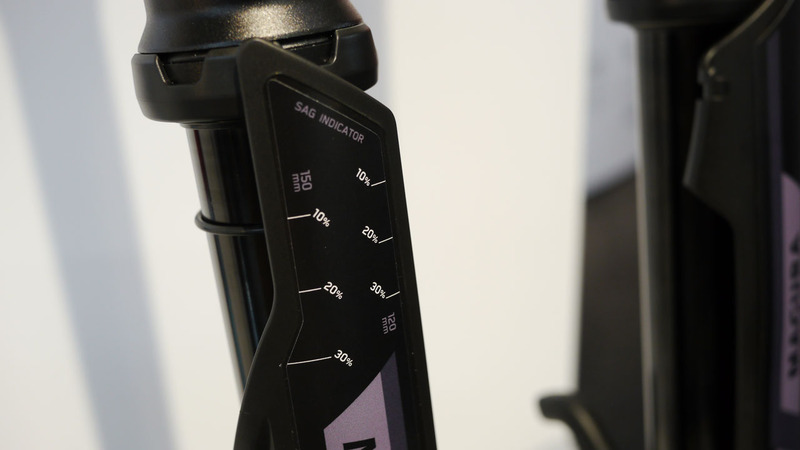 Putting the sag indicator on the guard is a smart way of not infringing any existing patents. 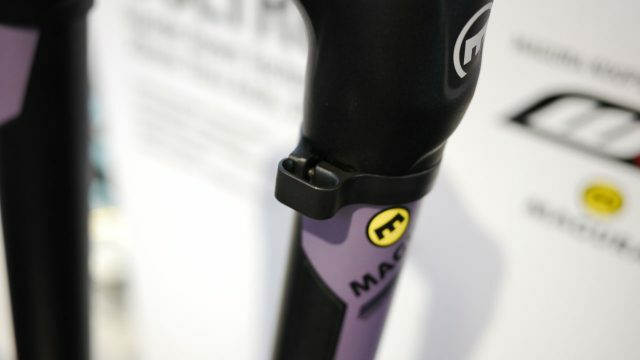 Though the forks are pretty chunky, they have a lot of nice organic detailing. 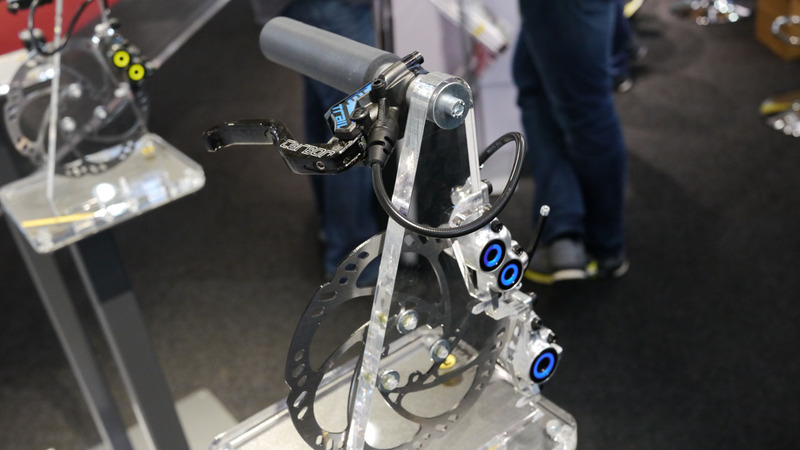 … which is a tidy guide to hold your hose right the way down near the caliper. 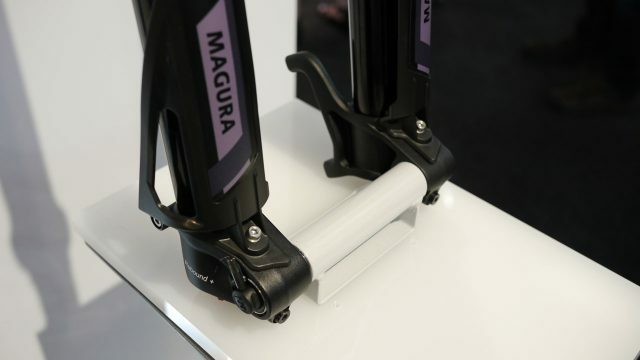 Another clever use of the stanchion guards, though we do wonder if the hose might slap against the uppers. 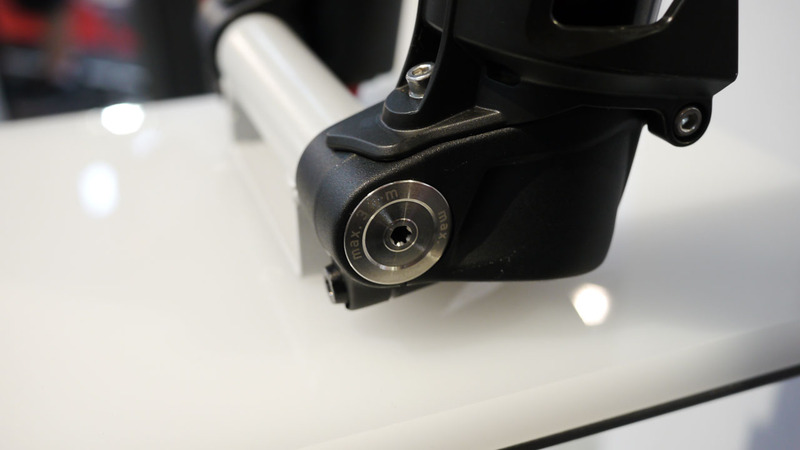 Here’s the other side of that flowy brake mount. 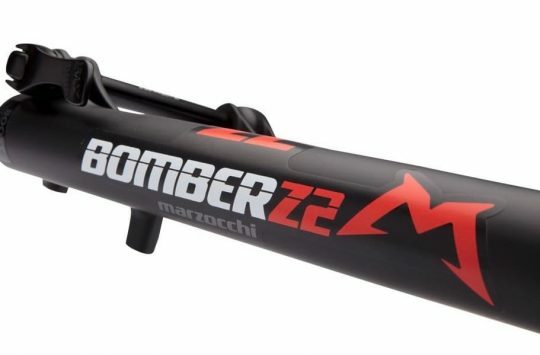 Unfortunately the Boltron will be OEM only for now. 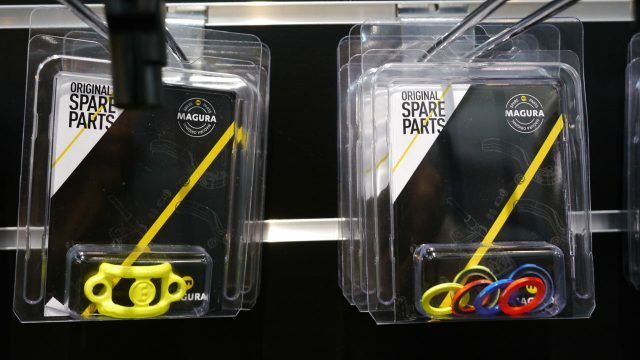 When I asked about retail, the Magura rep I spoke to paused, said “We’ll see” then added that they just couldn’t confirm anything for now. 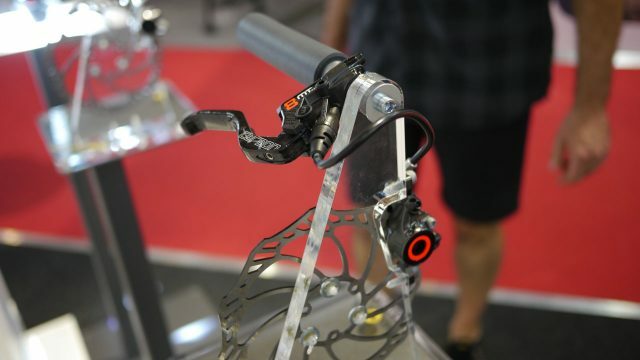 As well as the Boltron on that Haibike, we also spotted it had these levers, which are a total departure from the ones Magura normally ship with their brakes. 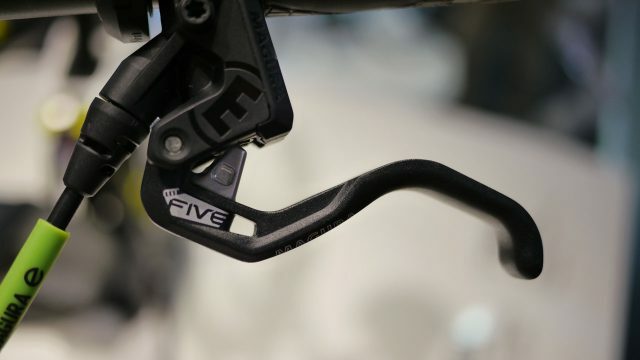 These HC levers were developed with Danny MacAskill. 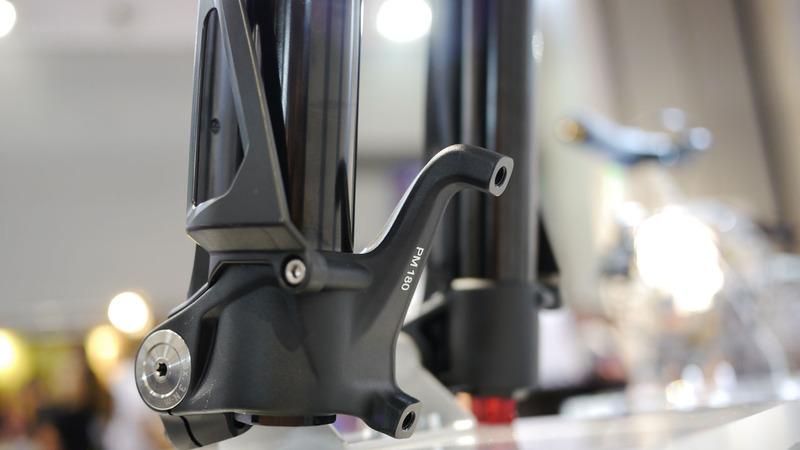 Not quite old and new, more standard and upgraded. If you have big hands, you can set up standard Magura levers for single finger braking, but if you’re sensitive to the flex the extra length can give them when used like that, the new 12mm shorter HC levers are probably for you. 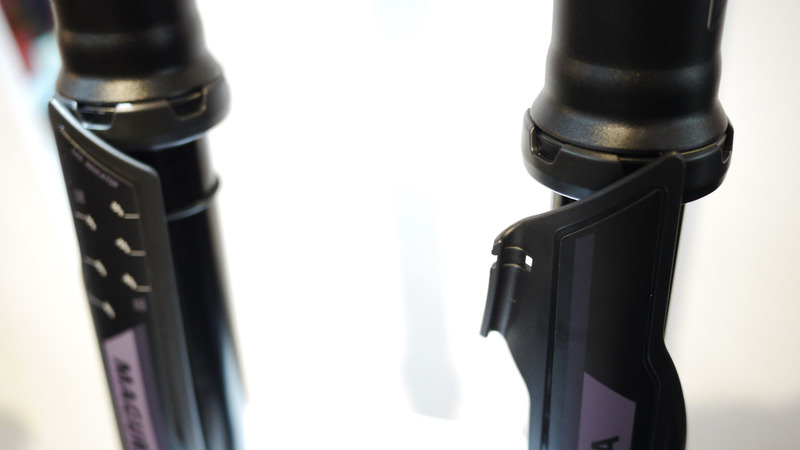 Retail is around €75, and there’s more information on their site here. 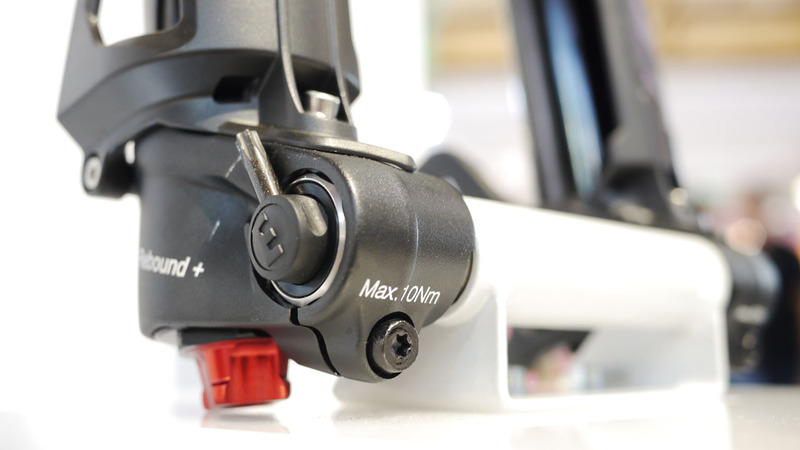 Though still shipping with two finger lever blades, most of their existing brake lineup has had a facelift, with various polished and carbon finishes, tricked out colour detailing, plus an updated range of brake pads and after market upgrades. 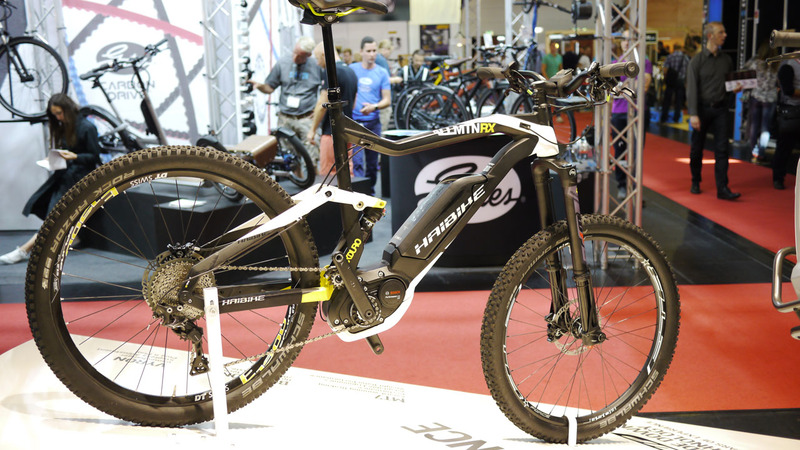 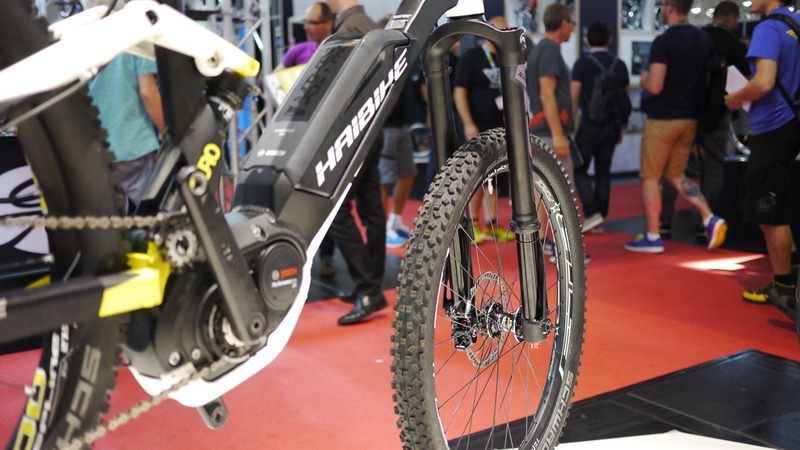 This is the MT Trail Carbon, winner of the Eurobike Award for bike components. 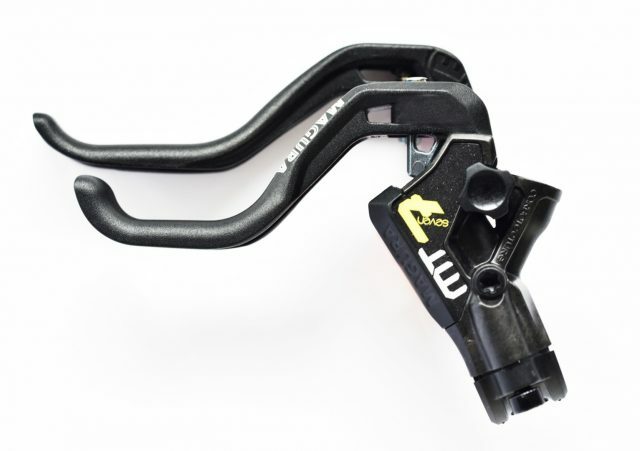 Carbon fibre lever blade, aluminium calipers; four pot for the front, two pot for the back, and a claimed weight of 330g. 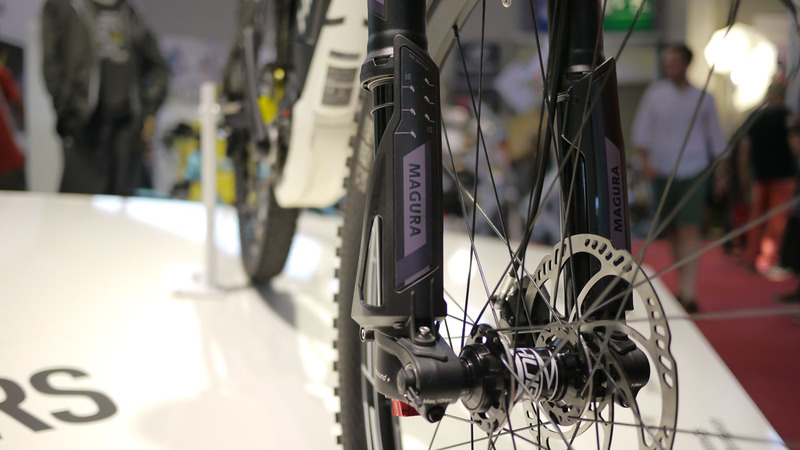 This is the Magura MT8 Carbon. Dropping the four pot in favour of two pot front and back brings weight down to 299g. 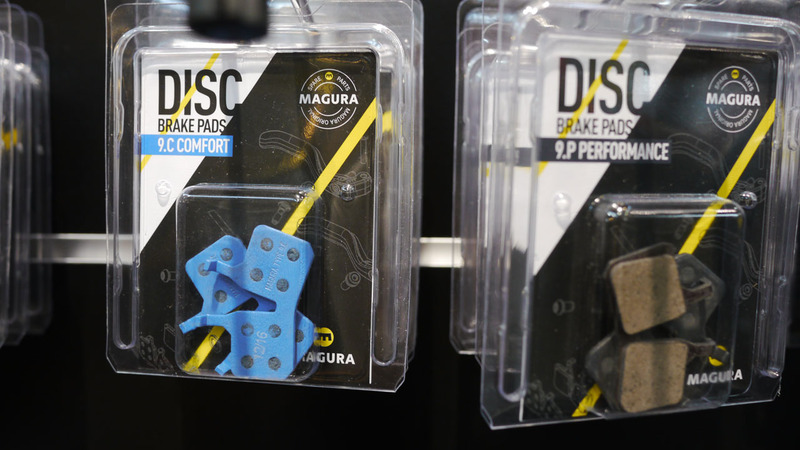 The pads on the left are Magura’s new Comfort pads, which are longer lasting but a bit less powerful than the black pads (right) they ship by default. 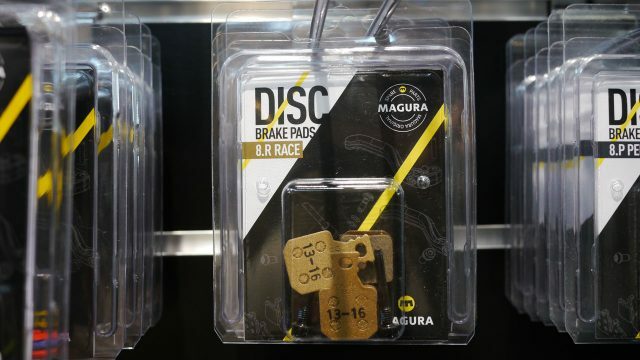 These gold pads are the new Race pads, featuring a softer compound and greater stopping power than their standard pads. They’re also offering a range of after market coloured components such as these brake piston covers and lever clamps, so you can obsessively bling up your brakes to match (or clash!) 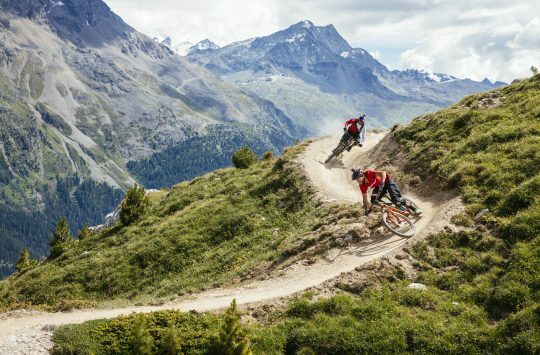 with the rest of your bike. 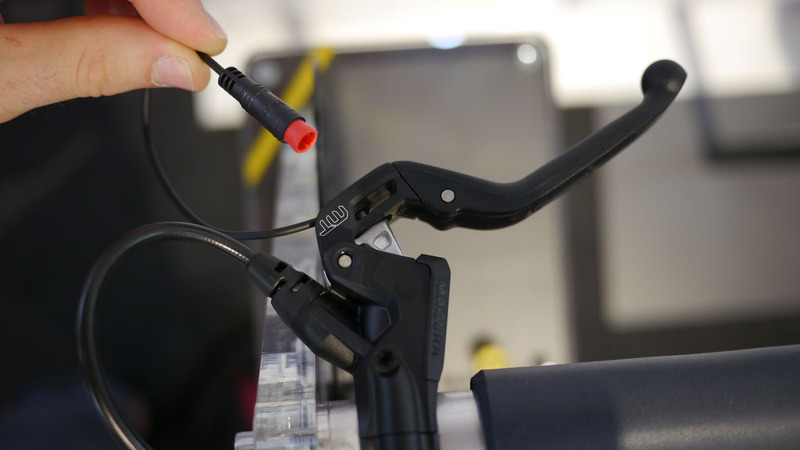 What’s that extra cable coming out of the lever? 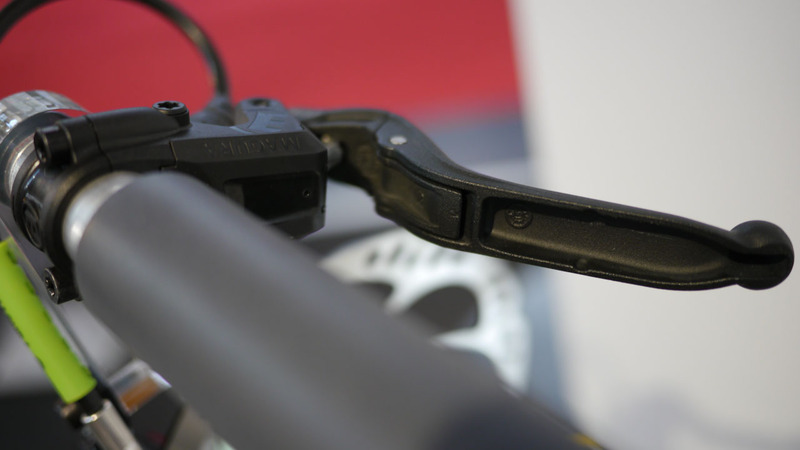 That wedge in the back of the lever blade is actually a switch, and on some of the e-bikes at the Magura stand, it did two things: cut the motor as soon as you start braking, and turn on a brake light at the back of the bike. 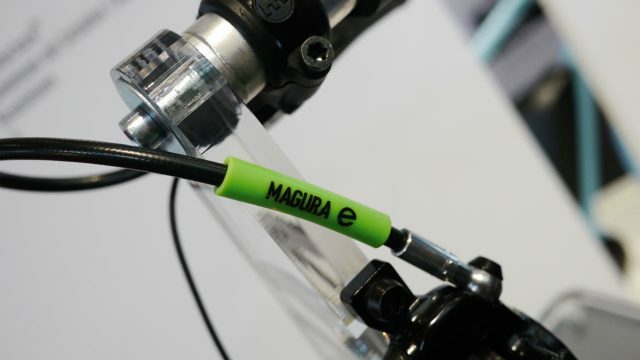 Magura were very clear in differentiating all their e-bike specific components.